Blog site & latest news for Uniquely Sporting's online shop for rare, vintage sports memorabilia & celebrity collectible souvenirs from Cricket to Soccer, Rugby to Golf, Motorsport to Boxing, Athletics to Equestrian, Baseball to Basketball, American Football to Ice Hockey, Darts to Cycling, Snooker to Tennis. Personally signed & authentic autographed items: Books, Photos, Prints, Posters, Artwork, Clothing, Caps, Hats, Shirts, Jerseys, Gloves, Balls, Bats & First Day Covers. 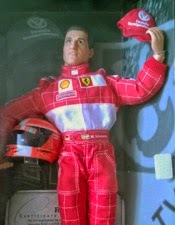 a Michael Schumacher Ferrari Action Figure by Mattel / Hot Wheels. 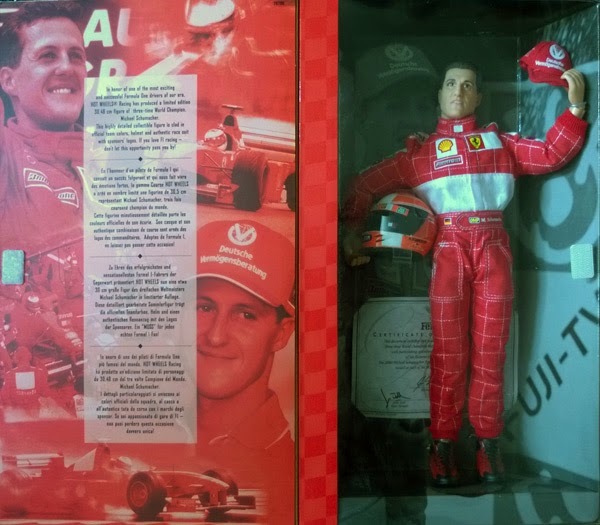 This 12" tall, limited edition Formula One collectable comes in the original, unopened box with a certificate of authenticity. Uniquely Sporting video intro "Sports MemRAPobilia"
Copyright Uniquely Sporting / Jarmageddon Ltd. Awesome Inc. theme. Theme images by spxChrome. Powered by Blogger.